Today is the 70th anniversary of the dropping of an atomic bomb on Nagasaki, Japan. By the end of 1945 up to 80 000 people in Nagasaki had died as a result of the bomb. In this article, the distinguished Australian journalist, Wilfred Burchett, writes in the London Daily Express of the effects of the bomb dropped on Hiroshima on 6 August. (The Daily Express knew Burchett as ‘Peter’.) The text of the article has been referred to us by Richard Tanter and we reprint it in full, first, because the story of Hiroshima and Nagasaki is as much part of Australia’s war history as it is of Japan’s and the world’s and, secondly, because of Wilfred Burchett’s status in Australian journalism. Tanter himself wrote an article on Burchett and the Hiroshima story. There is more on Burchett’s article and on Burchett, a controversial figure, from Amy and David Goodman, Robert Manne, Greg Mitchell, John Pilger and Bob Treasure. Honest History has a miscellany on Hiroshima-Nagasaki (and Lone Pine). 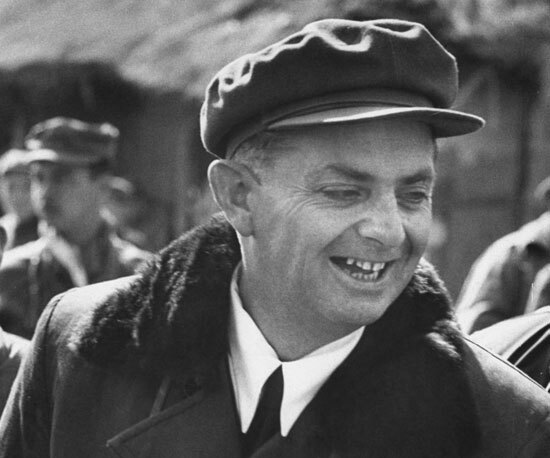 Update 4 September 2015: article from Burchett biographer Tom Heenan in The Conversation. 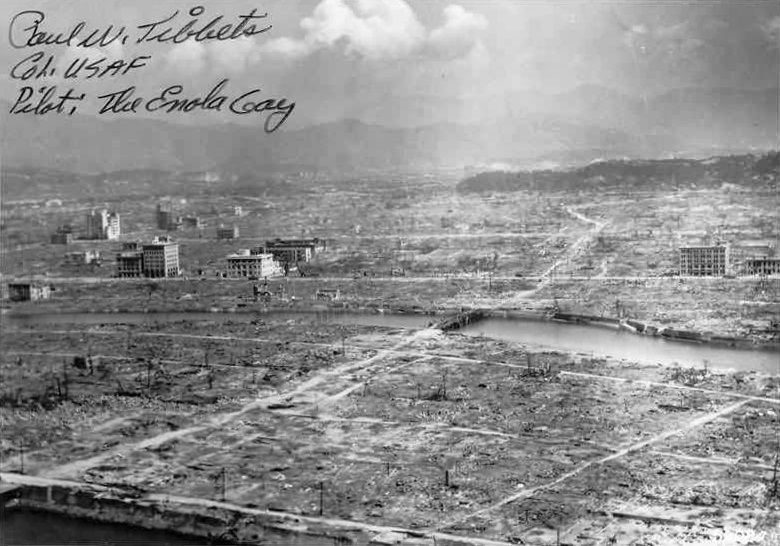 In Hiroshima, 30 days after the first atomic bomb destroyed the city and shook the world, people are still dying, mysteriously and horribly – people who were uninjured by the cataclysm – from an unknown something which I can only describe as atomic plague. When you arrive in Hiroshima you can look around and for 25, perhaps 30, square miles you can hardly see a building. It gives you an empty feeling in the stomach to see such man-made devastation. There is just nothing standing except about 20 factory chimneys ¬ chimneys with no factories. I looked west. A group of half a dozen gutted buildings. And then again nothing. The police chief of Hiroshima welcomed me eagerly as the first Allied correspondent to reach the city. With the local manager of Domei, a leading Japanese news agency, he drove me through or, perhaps, I should say over, the city. And he took me to hospitals where the victims of the bomb are still being treated. In these hospitals I found people who, when the bomb fell, suffered absolutely no injuries, but now are dying from the uncanny after-effects. For no apparent reason their health began to fail. They lost appetite. Their hair fell out. Bluish spots appeared on their bodies. And the bleeding began from the ears, nose and mouth. At first the doctors told me they thought these were the symptoms of general debility. They gave their patients Vitamin A injections. The results were horrible. The flesh started rotting away from the hole caused by the injection of the needle. And in every case the victim died. That is one of the after-effects of the first atomic bomb man ever dropped and I do not want to see any more examples of it. But in walking through the month-old rubble I found others. 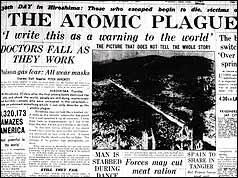 They believe it is given off by the poisonous gas still issuing from the earth soaked with radioactivity released by the split uranium atom. The American plane passed out of sight. The all-clear was sounded and the people of Hiroshima came out from their shelters. Almost a minute later the bomb reached the 2,000 foot altitude at which it was timed to explode – at the moment when nearly everyone in Hiroshima was in the streets. Hundreds upon hundreds of the dead were so badly burned in the terrific heat generated by the bomb that it was not even possible to tell whether they were men or women, old or young. If you could see what is left of Hiroshima you would think that London had not been touched by bombs. All these phenomena, they told me, were due to the radio-activity released by the atomic bomb’s explosion of the uranium atom. Hiroshima is in perfectly flat delta country. Nagasaki is hilly. When the bomb dropped on Hiroshima the weather was bad, and a big rainstorm developed soon afterwards. At Nagasaki, on the other hand, the weather was perfect, and scientists believe that this allowed the radio-activity to dissipate into the atmosphere more rapidly. In addition, the force of the bomb explosion was, to a large extent, expended in the sea, where only fish were killed. To support this theory, the scientists point to the fact that, in Nagasaki, death came swiftly, suddenly, and that there have been no after-effects such as those that Hiroshima is still suffering.